A chicory grew from a rock. Now that's some incredible luck. Who needs soil, or perfect rhymes, when you're chicory? This remarkable Cichorium intybus is holding court at Orchard Rd and 206, just north of town. I noticed it while dropping my daughter off for an internship at the office of Andrew Zwicker, whom some may remember as having been elected last fall to represent Princeton in Trenton. Most roadside chicory looks like this--sparse, gangly, off kilter. For a chicory to achieve such rich color and symmetrical form is singular, and drew at least one other photographer, seen on another dropoff day. More important for the chicory than our attention was that of a pollinator. Quite a nice flower when one takes a closer look. Keep your eye out for this one. It's a vine that's easy to identify, with a triangular leaf, prickly stem, rapid growth. Pull it out, preferably before it makes its small blue berries, or it will grow like a veil over your plantings. Put it in the trash, not someplace where it will get composted and potentially spread. Last year, I spotted it and removed it from two locations--along the gravel road to Rogers Refuge and along the edge of the north field at Princeton Battlefield--but not before it had made berries to grow a new batch this spring. In an ideal world, someone would be paid to, among other things, take early action to prevent a new highly invasive species from getting established in town. This year, Princeton will have, for the first time, a couple temporary workers focused on invasive species removal in town preserves. But that doesn't include state properties like the battlefield. Below is information from the Princeton Shade Tree Commission website about the meeting tonight at town hall. I've written from many different angles on the subject of Emerald Ash Borer (EAB) in recent years, such as this one. Type "emerald" into this website's searchbox and various posts will come up. The photo shows the size of the insect, and the "D"-shaped exit holes. A very experienced arborist I spoke to this week told me that he is injecting emamectin benzoate--the active ingredient in Arbor Mectin and TreeAge--for individual or specimen trees, and using imidachloprid where there are dense stands of ash that the homeowner wishes to save. Emamectin benzoate is more expensive but is more effective and lasts longer. There are no easy answers as to whether to try to save an ash, take it down now, or keep it until it succumbs. All have a financial cost. 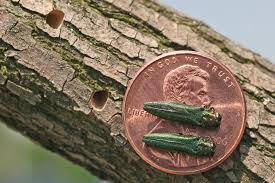 With 2000 ash trees in Princeton's public right of ways, and many thousands more in parks, preserves and public lands, this little insect introduced from Asia via shipping crates will have an ecological impact on our open space lands and cost Princeton and its residents millions of dollars. Due to the transport of species from one continent to another, all the free ecological, aesthetic, and cooling services ash trees have provided through history will now have a price tag. IMPORTANT MEETING ON THE EMERALD ASH BORER: PRINCETON WILL HOST AN INFORMATIONAL SESSION ON PRINCETON'S ASH TREES AND THE EMERALD ASH BORER, THURSDAY, JUNE 23, 7 PM, AT THE PRINCETON MUNICIPAL COMPLEX, 400 WITHERSPOON STREET. EVERYONE IS WELCOME. Thanks to Bay Daily of Cranbury for some timely help with steering growth at Princeton High School's ecolab wetland. To finish his freshman year in horticulturist Paula Jakowlew's class, Bay chose a hands-on project, which meant wading into the high school's thriving wetland hidden between the arts and sciences wings of the school on Walnut Street. His interest got me--one of the founders of this ecolab planting--in there as well, to supervise and do work that had long been needed to keep the wetland's 35 native plant species growing in harmony. You could call him a steward, or a weed warrior, but I like the term "plant keeper", because we're helping the plants to keep on keepin' on. Plants don't actively call out for attention. Most people see only an undifferentiated mass of green, and assume everything must be fine. A plantkeeper looks more closely, and takes action to encourage the good trends and discourage the bad, ultimately sustaining an aesthetic and ecological balance. The first task, oddly enough, was to cut back the plant species most associated with wetlands: cattails. The ecolab has two kinds: broadleaf and narrowleaf. I planted the narrowleaf cattail in a shady corner years ago, where it remained well-behaved until some of it got established where there was lots of sun. With all that extra energy to drive its growth, this species that I had thought to be docile began to run rampant over other native species--sedges, rushes, and wildflowers like the hibiscus in this photo. The cattail expands its domain via rhizomes that send up new stems as they spread underground. Much of the work we do to maintain a balance of native species involves cutting back the aggressors that have rhizomes. Cattails, and the floodplain versions of sunflower and goldenrod, live in highly competitive environments in the wild, where their aggressiveness is necessary for survival. Put them in the tamer environs of a manmade wetland and they will take over if not held in check. This is the trap we gardeners fall into over and over. A new garden has lots of space to fill, so one puts in plants that will spread to cover the bare ground, only to later regret their aggressive behavior. Many homeowners have experienced this with nonnative plants like english ivy, myrtle, or bamboo, but the same imbalance can happen in an all-native garden. In two after-school sessions, we cut down hundreds of cattail stems to weaken the roots and provide sunlight to other species. One interesting notion is that American Indians took advantage of the cattail's aggressiveness by harvesting it for food. Many parts of the plant are edible, and steady harvest would have curbed the cattail's tendency to take over. Then there was some trimming back of the opulence to keep sidewalks clear. One of the great things about this wetland is that there's an elevated walkway all around it, allowing people to look down at this watery world of wildflowers, crayfish and frogs. The other nice aspect of the planting is its isolation, so that problematic species that would tend to throw things out of balance can be prevented from becoming established. A single native Virginia creeper vine growing up the wall got this preventative treatment. We came upon what's likely a nonnative species--pond water starwort, which will slowly blanket the wet areas unless it's removed next winter. Here's a closeup of this plant, which looks like the native duckweed but has a stem. Above ground, there's a similar blanketing threat. Though bindweed, a nonnative morning glory vine, has been less of a problem than I would have predicted, it still needs to be discouraged to keep it from growing over everything. Bay and I found time to appreciate and weed around some of the plants that are staying where they were planted. Retiring science teacher Tim Anderson planted this Atlantic white cedar donated by a Princeton resident, Bill Sachs. A snail, apparently with a hitchhiker in tow, navigated the hairy leaves of boneset. A cup-plant and a persimmon are flourishing along the wetland's edge, on higher ground but still able to tap into the water just below the surface. A few swamp milkweeds have persisted, hopefully to feed monarch butterfly caterpillars later in the summer. The cattail has a soft inner core whose edibility I was confident enough of to try some. Not bad. A glance down at the water shows that it's a good year for elderberry blossoms. And making it all possible, the high school's sump pump, which so fortuitously spills its year-round beneficence into this improbable wetland. It was great working with Bay to keep this wetland keepin' on. Our Climate Cabaret troupe will be debuting a new piece at our June 18 performance this Saturday at the Labyrinth Bookstore. The performance is at 3pm on the lower level, and is free. We'll be portraying various characters, animating the inanimate, and reanimating the animate. There's a car and its driver, a climate cowboy who will try to sell you on his OK Leaf Corral, a Captain and Crew on the space station orbiting earth, and then there's a turf therapist and his patient, the lawn. 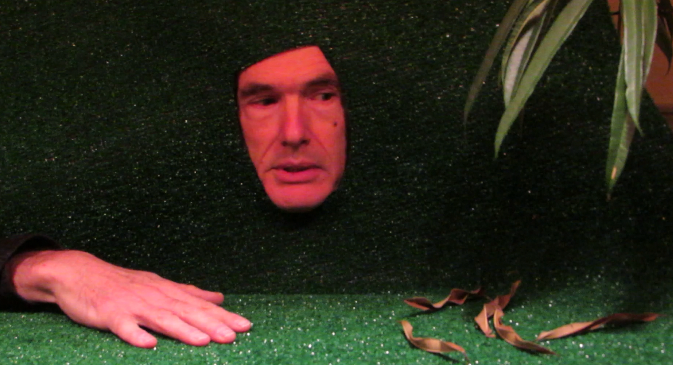 I'll be the lawn, and I have to say that I am honored and humbled to serve as spokesman, or, if I can get the wig to fit, a spokeswoman, for all those super neat, really messed up lawns out there that live empty but opulently indolent and drug-addicted lives as basically kept women for their respective Houses. Finally, we'll find out what lawns have been feeling all this time. If you want to get the full whammy, my band, the Sustainable Jazz Ensemble, will be performing the evening before, this Friday, June 17, from 7-9 on Hinds Plaza next to the Princeton Public Library. Below is an early, unisex rendering of me as a lawn, concerned about some leaves that are marring my beautiful green expanse. Central Park back in April, where a glorious nature is framed by a Manhattan skyline, like a verdant postage stamp in the Forever series, 50 blocks long and 3 long blocks wide. The land's mix of rock outcroppings and swamps, a desire to emulate parks in European countries, and a healthy dose of 20/20 foresight (short history here) all played a role in sparing this ground from economic imperatives, a place where nature can have its day, every day. Central Park is ringed by museums of art and history, but Central Park's history is of the living sort, etched in infinite varieties of green and blue, enduring but ever changing, bottomless in its imagination, needing no roof other than the sky. Spring migratory birds, shuttling like ambassadors between earth and sky, continent and continent, drew a crowd of admirers welcoming their return, cheering their journey, as if the birds were sailers just off the ship. while a raccoon's interest in the tree was more structural. Indifferent to our earthbound attention, it snoozed through the day in its high rise apartment (no elevator but rent controlled) in the crotch of the tree. I could count on one hand, well, maybe two, my visits to Central Park, and yet it strikes deep chords within. Buildings are usually framed by nature, but in Central Park, its the buildings that do the framing. Get to know plants on a first name basis, and they will become like old friends you run into wherever you go. Central Park is like seeing an old friend all dressed up in a suit for the first time. The habitat restoration being done along the trails of the Ramble are not yet Shakespearian in depth--Shakespearian here defined as the more you look, the more you see. But the restoration of expanses of native wildflowers, grasses, sedges and ferns on the forest floor is sufficient to trigger memories of the rich understory many eastern forests had just a few decades ago. Though ringed by concrete and highrise buildings, Central Park has in some ways a better chance to be natural than more rural areas thrown out of ecological balance by intense browsing pressure and unfettered invasive species. I know of only one bluebell growing in Princeton's preserved open spaces. Central Park has many, protected from their primary threat, straying pedestrians. A cool-season grass, presumably native, is being used on slopes for erosion control. One reason why prospects are good for native plant restoration in Central Park is the vast pool of potential volunteers to draw on, given the auspicious ratio of NY's residents per acre of greenspace. Not that one needs any additional evidence of the shear scale of human numbers in NY, but the Run-As-One fundraiser that day in Central Park drew 8000 participants, royally served by a row of Royal Flushes extending as far as the eye could see, that might rival some nearby buildings if stacked one upon another. Might this be an irreverent artist's vision of infinity? How does one capture the scale of the operation, all of which must be periodically latched to stretched out trailers and hauled away for a bit of refreshing? Clearly, I digress, but then again, how many nature posts are thoughtful enough to provide a bathroom break midway through? Segueing smoothly back into nature, here, a Fothergilla ornamenting some snazzy bins. Park volunteers were spending a beautiful spring afternoon immersed in their own sort of marathon, pulling weeds, including the lesser celandine, that pretty but very rapidly spreading plant that had a post devoted to it earlier this spring. The leader explained that herbicide use is not allowed in the park, so they're having to pull each lesser celandine individually. They showed me the tuberous roots. Pretty slow going, but fortunately, there isn't much of it in the park. A few places in the park benefit from a thoughtful lack of intervention. These spent daffodils are being left unmowed so the post-bloom leaves have a chance to feed their roots for the next year. There was some conspicuous smooching between a tree and boulder, familiar to anyone hiking the Sourlands or the Princeton Ridge. Nature has always thrived on an intimate relationship between the animate and the inanimate. A gentle breeze propelled sailboats and memories of daysailer days. Princeton has a couple of these Carolina bells (Halesia), one on Snowden, one on South Harrison. Strangely, almost no dogwoods were to be found in Central Park. A frame within a frame, as nature, framed by the city, frames a sculpted shelter. A grove of elm trees brings back memories of what American streets used to look like before Dutch elm disease swept through. Leaving the park, we found Teddy Roosevelt in good company at the entryway to the Natural History Museum. Might he offer them horses as well? Looks like they're all trying to get back to the nature in Central Park. Just inside the Natural History Museum, there appeared to be an allegorical confrontation between Truth and Towering Ignorance. Might Congress's high dome be accommodating something similar? Nice to see that T-rexian Truth had a nice set of choppers, though it wasn't clear who was going to win. Whatever purpose this bamboo patch at Princeton Battlefield was originally supposed to serve--screening?, poles?, bamboo shoots?--its expansionist tendencies have led to ongoing attempts to eliminate it. Last year marked a turning point in the battle to prevent the giant clone from blocking the old trail between Clark House and the Stony Brook Meeting House. Because of strategic interventions in both spring and early summer by the Battlefield friends, all that remained this spring of the mighty stand were low, grassy clumps of bamboo leaves huddled near the ground. However, as expected, the root system still had enough energy to launch a new generation of strong vertical shoots this year, aspiring to regain its lost ground and resume its expansion into the trail and the area where a barn once stood. Protecting these historic features of the Battlefield means returning again this June to cut down the new stems before they can start collecting solar energy. Since expansionist plants can be so daunting to counter, it's satisfying to intervene when the stems are soft and easily cut with a pair of loppers. Just across the path, the volunteers left a big pile of porcelainberry vines cleared from a patch of ground they wish to reclaim from the "kudzu of the north". There's a native plant mixed in. Beneath the grape-like leaves of the porcelainberry is a sea of the lighter green leaves of jewelweed, whose tubular orange flowers attract hummingbirds.